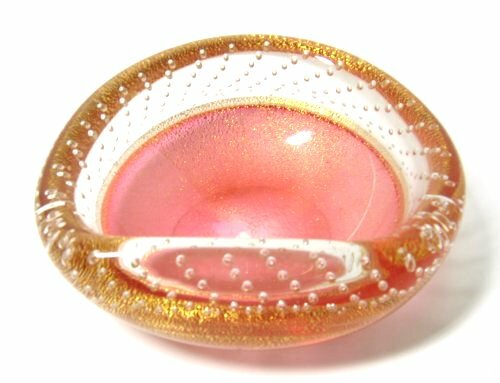 Murano Seguso Cranberry Controlled Bubble Incalmo - Gold Flecks! This GORGEOUS piece is in the incalmo style of ARCHIMEDE SEGUSO 1950's. A burgundy cranberry red bottom with a profusion of golddust flecks encased in clear glass. 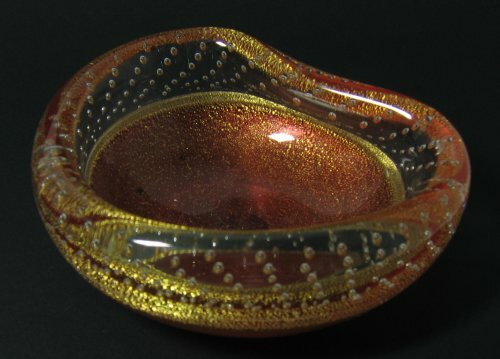 The controlled bubbles start at the top of the gold and cranberry bottom and carry to the top of the bowl. This section is clear glass but the reflection of the gold dust scattered on the bottom layer gives the illusion that the gold is scatterd to the top layers. 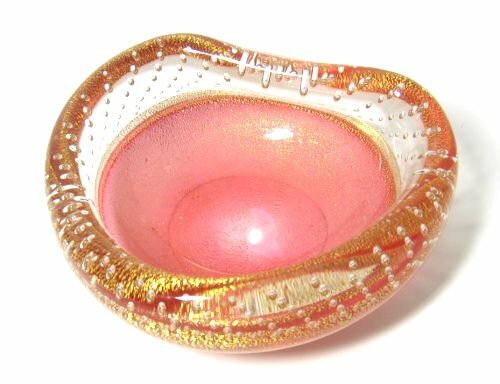 This wonderful piece has all the characteristics of Murano glass by Seguso although there is no label. Measures 5" x 4" on folded side, and 2" high. In excellent condition with minor bottom surface scratches and wear consistent with vintage age.